Years ago the normal way of organising our day-to-day life was with a calendar hanging on the kitchen door. But now, with the internet; smart phones, tablets, etc – there are so many more ways we can keep our lives in check. We now find ourselves with a range of online tools for those everyday tasks that were once so tedious! It’s time to embrace the digital age and all it’s short cuts with these 5 great online tools for organizing day-to-day life! Do you spend a lot of time travelling? If so, then Trip It is your answer. For stress free trips, Trip It comes in handy for organizing all the necessary details and storing them in one easy, simple and accessible place! Providing an itinerary, Trip It is an app you can download on your iPad or iPhone! Once you start using it, you’ll wonder how you ever survived without it. Being made of just a single HTML file, TiddlyWiki is portable and can be used on email, the internet or flash drive! TiddlyWiki is your very own personal web notebook to keep your ideas and organize information. Perfect for those times when you need to quickly note something down, keep tabs on something or even save something for later – when you have time to deal with it properly. Cozi.com is a great way to maintain order and structure for families with a slightly hectic schedule! If you have more than one child, you probably find yourself running around after them, and you sometimes probably find yourself getting lost in their schedules of classes, clubs and play-dates. Cozi keeps the family connected online, making it easier to keep track of what everyone is doing and where they are. The website also enables you to create lists! 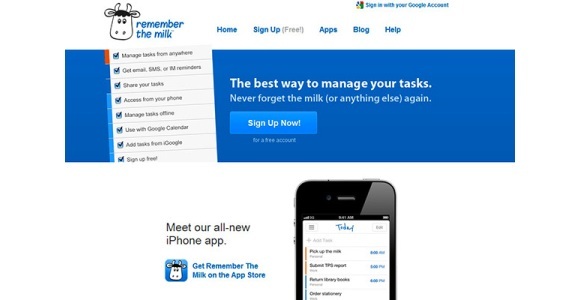 “Remember the Milk” bids farewell to those forgetful trip ups with easy to use tasks and to-do lists! You’ll get reminders via email, IM or SMS, so you and other users can manage tasks from anywhere. It also comes with a plug in for Google calendars, great if you’re syncing up not only your own schedule – but your partners and your children’s too. It’s also great for business usage – because you can get everyone in the office signed up so they know just what needs doing. Sign up is free, so there’s no excuse not to try out this efficient tool on your journey to daily organization! Orgjunkie.com is a great way to snap you into ultra organized mode! This website offers a great insight into ensuring a stress free approach to life’s everyday tasks, and will help you relive the stress of mentally trying to keep everything in check. Brimming with advice and tips on storage solutions and time tactics, this website is a great way to learn more about changing your daily routine to a much simpler and structured rhythm! Sarah works for G-Technology and loves writing about techie gadgets and great tech apps for all types of people.